Forestry scientists from Canada and Catalonia have been working together over the last three years in the framework of the Newforests project, which has focused on the international exchange of knowledge. About to finish the project, principal investigators from the institutions taking part have met in Montreal to explore new possibilities for the future. During the three-year project Newforests, more than fifty researchers have moved between the two continents in order to continue and enrich their researches. Fruit of this exchange, different strategies around sustainable forest management, biodiversity and dynamics of forests have been developed, and more than 30 articles in international journals have been published, as well as book chapters and international workshops. In addition, the project also served to lay the foundations for an international forestry research platform. To provide continuity, a meeting was held in Montreal by the principal investigators from the institutions taking part, the Forestry Sciences Centre of Catalonia (CTFC) and the CREAF from Catalonia, and the Centre d’Étude de la Forêt (CÉF) from Canada. 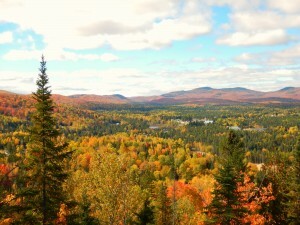 In the same line of reasoning, Pierre Drapeau, co-director of the CÉF emphasized the success of NEWFORESTS in developing a successful network of scientific collaborations between Quebec and Catalonia forest science researchers. However, Drapeau explains that “consolidation of such collaborations will require increased funding specifically aimed to support international initiatives such as Newforests by Quebec and Canadian research agencies”. The CÉF is willing to work in that direction in the coming years. Catalonia, with centers like the CTFC and CREAF, hosts much of the country’s forestry research and represents an attractive target for establishing such collaborations. In a context of global change, forests will face new environmental conditions and pressures. Comparing and integrating approaches between different regions of the world will increase our chances of anticipating global change effects on future forests. It will also allow the development of comprehensive science-based management approaches that will help us to make smarter decisions matching the level of current challenges that the society is now facing.